With growing concerns about the negative health effects of sports-related concussions in recent years, the American Medical Association (AMA) voted at the June 2015 Annual meeting to adopt policies aimed at reducing the risk of concussions in young athletes. The new policy addresses the need for prompt diagnosis and appropriate concussion management plans in treating sports-related concussions. A comprehensive report developed by the AMA Council on Science and Public Health (CSAPH) with recommendations to help physicians in their efforts on this important issue can be accessed through the AMA website. However, it is important to note that the recommendations and information in the report are also valuable for all non-physician members of the community who are influencers in this issue, including, but not limited to: parents, coaches, trainers, teachers, administrators and policy makers. According to the Centers for Disease Control (CDC), between 1.6 mill and 3.8 million sports and recreation related traumatic brain injuries, including concussions, occur in the United States each year. 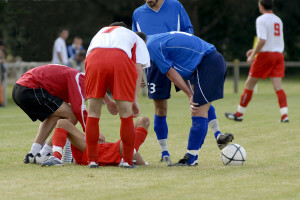 Concussions represent about 9% of all high school athletic injuries and 6% of all collegiate athletic injuries. A study of high school athletes with concussions also found that 15 percent returned to play prematurely, and nearly 16 percent of football players who sustained a concussion that resulted in loss-of-consciousness returned to play in less than one day. supports requiring youth athletes who are suspected of having sustained a concussion to be removed immediately from the activity and allowed only to return with a physician’s written consent. encourages development and evaluation of effective risk reduction measures to prevent or reduce sports-related injuries and concussions. As the AMA report concluded, athletes who are not fully recovered from an initial concussion may be significantly vulnerable for recurrent, cumulative and even catastrophic consequences of a second concussions. Such concussions can be prevented if athletes are allowed time to recover and the decisions to return to play are made carefully. Even mild concussions should not be taken lightly — although some concussions are more serious than others, there is no such thing as a “minor concussion.” It would serve all of our athletes well if the overall community helps support changing the current culture where athletes resist both the self-reporting of concussions and compliance.